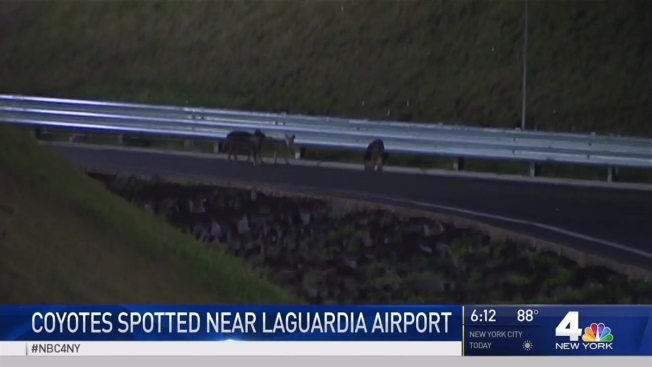 A coyote family is raising a large litter of pups in an isolated area near LaGuardia Airport. Wild Dog Foundation founder Frank Vincente tells the Daily News that eight coyote pups were initially spotted in Queens. But it appears only five of them have survived. Vincente says he shooed the mother and two of the pups off a road last week. He believes the mother may be the coyote seen last year on the rooftop of a bar in Long Island City. Coyotes have been spotted periodically in New York City since the 1990s. Experts estimated last year that the population was probably at least in the teens. The animals are generally shy. But wildlife experts recommend precautions: Don't feed coyotes, and secure your trash and pets. They may also view your pet as prey. Never feed coyotes—it is illegal to feed coyotes in most places. Feeding endangers your family and neighbors as it lures coyotes into neighborhoods. Keep unattended cats and dogs indoors or in completely enclosed runs, especially at night, and do not assume that a fence will keep a coyote out of your back yard. Leave noisemakers on hand to scare away coyotes that may enter your yard, such as whistles and horns. Yell, clap hands, blow a whistle and try to make yourself look larger if you have a close encounter with a coyote.